Our goal is to contribute thoughtfully to the public discussion about ensuring a safe and efficient financial system. In Regulating Wall Street: CHOICE Act vs. Dodd-Frank, we assess the strengths and weaknesses of the Financial CHOICE Act while proposing new ideas and recommendations. 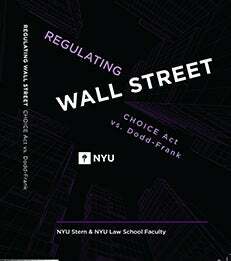 The NYU Stern School of Business today announced a new book, Regulating Wall Street: CHOICE Act vs. Dodd-Frank, authored by more than a dozen faculty members from NYU Stern and the NYU School of Law. With the change in power in Washington D.C., both Congress and the Administration seek to repeal parts of the Dodd-Frank Act of 2010, streamline regulation and reduce compliance costs. In their analysis, the authors address the prominent issues of financial regulation and examine the benefits and drawbacks of the CHOICE Act—the prominent proposal to reform financial regulation—while comparing it to Dodd-Frank. The book is a compilation of essays that analyze both Acts and call for significant changes. While the authors view Dodd-Frank as too burdensome, the CHOICE Act fails to address systemic risk properly. For example, the CHOICE Act’s proposed elimination of the designation of Systemically Important Financial Institutions (SIFIs) and Financial Market Utilities (FMUs), together with the Act’s prohibition of temporary government lending to resolve failing SIFIs, will exacerbate the too-big-to-fail problem. Furthermore, the CHOICE Act, like Dodd-Frank, fails to offer any solutions for Fannie Mae and Freddie Mac, for the counterproductive complexity of the U.S. regulatory structure, and for nonbanks’ de facto (“shadow”) banking activities. - The CHOICE Act’s off-ramp is not appropriate for large, systemically important banks. While Living Wills and stress tests would be overly burdensome for most banks, they are necessary for the largest, most complex and most interconnected banks. The CHOICE Act’s proposal to allow an off-ramp for systemically important banks with capital greater than 10% of assets would not protect the financial system against financial crises. - Non-bank institutions that present systemic risk need strict regulatory oversight. The CHOICE Act should not eliminate the designation and heightened regulation of Systemically Important Financial Institutions (SIFIs) and Financial Market Utilities (FMUs). Furthermore, neither Dodd-Frank nor the CHOICE Act adequately plan for the resolution of a failing FMU. - The book expresses some support for the CHOICE Act’s replacement of Dodd-Frank’s Orderly Liquidation Authority with a revised version of the bankruptcy code. That said, temporary access to public funds for large, failing financial institutions is a must. For a resolution plan to be optimal and credible, even under a new bankruptcy code, temporary access to public funds is needed. The CHOICE Act currently restricts all access to public funds. - The CHOICE Act’s repeal of the Volcker Rule is sensible. The current Volcker Rule is too inefficient in controlling systemic risks to justify its high compliance costs. - The CHOICE Act would inappropriately diminish the Fed’s independence. The independence of monetary policy, which contributes significantly to good economic performance, would be overly curtailed by the CHOICE Act’s mix of rules and audits. - The Consumer Financial Protection Bureau (CFPB). The CFPB should move away from product bans as recommended by the CHOICE Act, but needs authority to protect consumers. The CHOICE Act would limit the flow and public dissemination of information to consumers. - U.S. financial regulators, GSEs and U.S. housing finance. The financial regulatory structure in the United States is full of loopholes and overlapping jurisdictions among multiple regulators that add to costs, complexity and risks. It should be radically streamlined. U.S. housing finance should be moved toward a private system, with any government guarantees priced by the market. - De Facto (Shadow) Banking. The systemic risks within the de facto (shadow) banking sector must be contained. Regulatory reform should anticipate efforts to circumvent strict regulatory oversight of the largest, most systemic banks by regulating de facto banking activities. Regulating Wall Street: CHOICE Act vs. Dodd-Frank adds to Stern’s roster of published works on the Financial Crisis of 2007-2009 and financial regulation including: Restoring Financial Stability: How to Repair a Failed System; Regulating Wall Street: The Dodd-Frank Act and the New Architecture of Global Finance; Dodd-Frank: One Year On; Guaranteed to Fail; and Modernizing Insurance Regulation. The book’s four editors are Professors Matthew P. Richardson, Kermit L. Schoenholtz, Bruce Tuckman, and Lawrence J. White. The authors are Professors Barry E. Adler, Thomas F. Cooley, Yiwei Dou, Ralph S. J. Koijen, Thomas Philippon, Matthew P. Richardson, Stephen G. Ryan, Kermit L. Schoenholtz, Philipp Schnabl, Marti G. Subrahmanyam, Bruce Tuckman, Stijn van Nieuwerburgh, Laura L. Veldkamp, Paul A. Wachtel, Ingo Walter, and Lawrence J. White. A complimentary download of the book is available HERE. The book is also available in paperback on Amazon HERE.